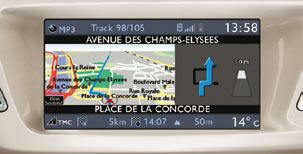 - satellite navigation system information. press the "ESC" button to abandon the current operation and return to the previous display. For further information on these applications, refer to the "Audio and Telematics" section or to the specifi c user guide given to you with the other owner's documents. This menu allows you to select the language used by the display: Deutsch, English, Espanol, Français, Italiano, Nederlands, Polski, Portugues, Türkçe * . This menu allows you to set the date and time, the format of the date and the format of the time (refer to the "Audio and Telematics" section or to the specifi c user guide given to you with the other owner's documents). This menu allows you to set the brightness of the screen, the screen colour scheme and the colour of the map (day/ night or auto mode). - wiper linked with reverse gear (refer to the "Visibility" section), - guide-me-home lighting and duration (refer to the "Visibility" section), - parking assistance (refer to the "Driving" section). This menu allows you to select the units: temperature (°C or °F) and fuel consumption (km/l, l/100 or mpg). 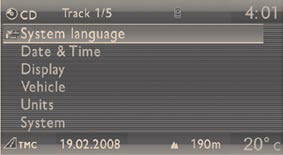 This menu allows you to restore the factory confi guration, display the software version and activate scrolling text. 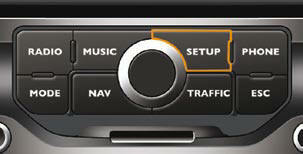 For safety reasons, confi guration of the multifunction screen by the driver must only be carried out when stationary.